My ancestors are from Turkey where most of them have jobs watching sheep. I am rather outdoorsy, so I need a big yard or space to exercise. Running is one of my favorite things to do, so if you go jogging, I would enjoy going along (if you can keep up!). I am extremely loyal to my people family and very protective of their belongings. I am also extremely strong and brave. I learn quickly and am interested in pleasing, but I must be acclimated to family life if you want me to fit in well and become a good companion. When fully grown, I am between 27 and 32 inches tall (68.6 to 81.3 centimeters) and I weigh between 80 and 140 pounds (36 to 63 kilograms). We have no Anatolian Shepherd Dog Breeders listed at this time. 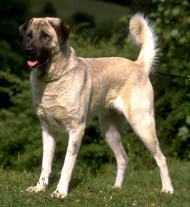 Click here to place your Anatolian Shepherd Dog Ad!